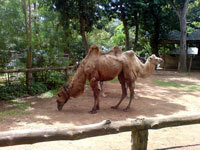 Colombo's zoo has a fine collection of animals, birds, reptiles and fish from all over the world, but in particular showcases the fauna of the island. The complex includes an aquarium, displaying more than 500 varieties of aquatic life. There is also a walk-through aviary, reptile enclosure and butterfly park. One of the most popular attractions at the zoo is the daily elephant show, which takes place at about 5.15pm. Another favourite feature is the sealion show, which is great fun for kids. Animals in the park include hippos, flamingoes, kangaroos, lemurs, monkeys, orangutans, leopards, lions, otters, raccoons, rhinos, giraffes and tigers. The zoo has a good selection of animals and receives great reviews from some visitors, but those animal lovers accustomed to spacious European and American zoos may be disconcerted by the size of the animal enclosures. The zoo is undergoing improvements and renovations currently which may make a difference. Nevertheless, families travelling with children should enjoy the zoo if they have a few hours to kill in Colombo. The zoo is extremely popular with locals and it is a good idea to get there early in the morning to avoid the crowds and to see the zoo at its cleanest and best.